Following the usual practice the Organising Committee decided to offer half of the tickets for sale abroad. 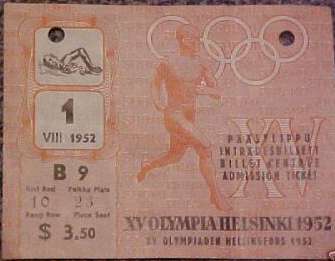 The uncertain world situation during the years preceding the Games and the inflatory trend evident in Finnish economic life meanwhile made the question of ticket sales extraordinarily difficult and held up important decisions. a Box Office for sales abroad. The bulk of the tickets were for a single occasion. 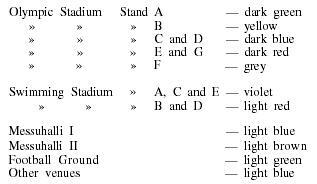 Day tickets were printed solely for athletics, fencing, shooting, the modern pentathlon and equestrian events outside the Olympic Stadium. No series tickets were sold to the public. 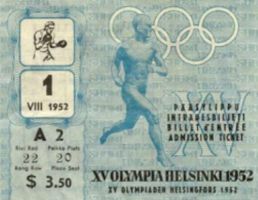 In the top left corner of the ticket was the symbol of the sport in question, below that the date, the stand and seat number and the price in dollars (on those sold in Finland the price-category only). On the right was a clock-face with the hands set at the time appointed for the event. A plan printed on the back of the ticket showed how the stands could be reached. The idea behind this use of colour was that it would facilitate traffic guidance in the central Olympic area. In practice too much importance was seen to have been attached to traffic. It would have been more appropriate to distinguish differently priced tickets with colours. 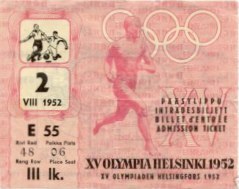 The tickets were printed by the note-printing press of the Bank of Finland on banknote paper with a rose-coloured watermark, which made forgery difficult. Printing began in July 1951 and went on for four months. The note-printing press kept the tickets in its own safe custody, releasing batches for distribution as ordered. Tickets to the preliminary hockey, basketball and football rounds and the extra gymnastics competition on July 19th were printed at private commercial presses immediately before the Games. The Municipality of Hämeenlinna printed additional tickets for the modern pentathlon swimming event. These so-called »occasional tickets» were simpler in design. No tickets were printed for the yachting competitions, as it was decided that no »stands» could be arranged from which spectators could follow the races closely. 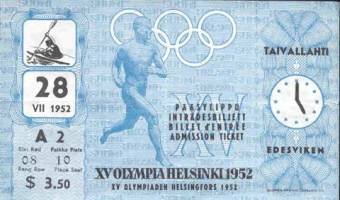 The total printings at the note-printing press of the Bank of Finland were 2 049 096 tickets. Printings by private firms totalled 345 003 tickets. The over-all total was thus 2 394 099 tickets.